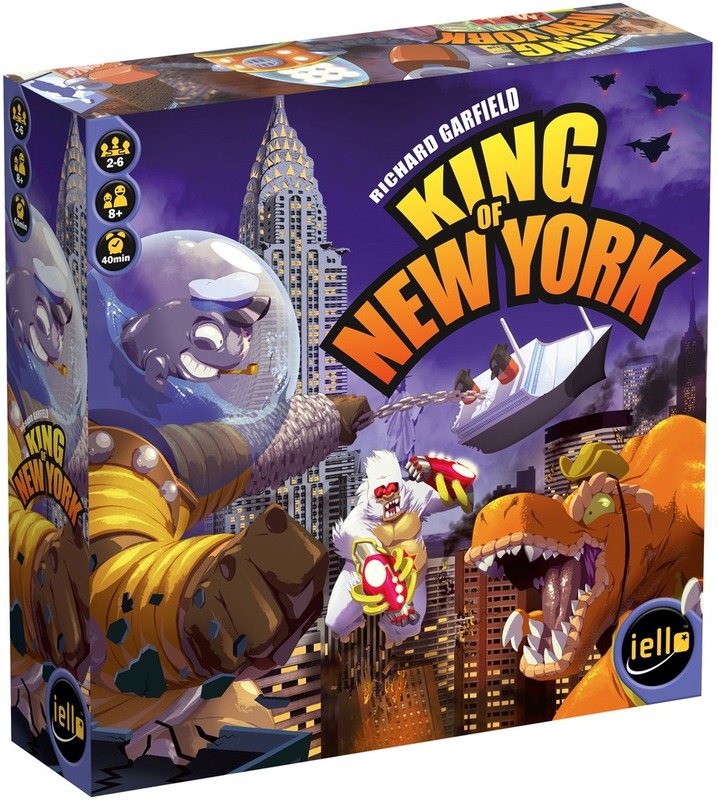 King of New York is the second generation game from the well-known designer, Richard Garfield. 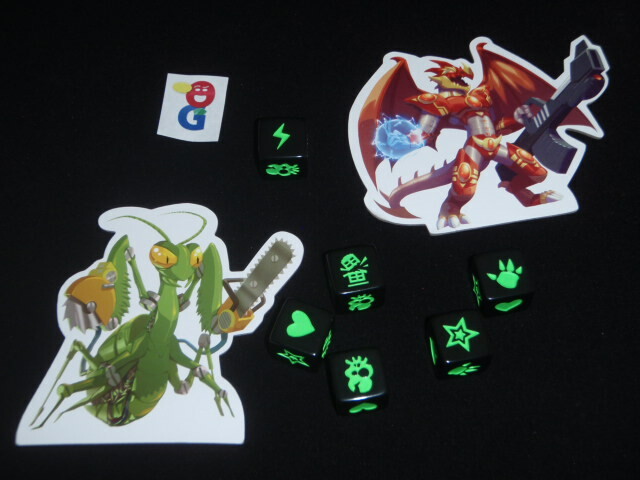 You may have played the predecessor of this game, King of Tokyo – a pretty big hit a few years back. In King of New York (KoNY), you take on the role of a monster – and you try to be either the first monster to 20 VPs or the only monster left standing in the five boroughs. At the start of the game, each monster has 10 life points and zero VPs. Building tiles are shuffled and three stacks of three buildings each are placed in each of the five boroughs of the city. Each of these buildings has a building valued between 1 and 3 on it. If the building is destroyed, it is flipped over, and then a military unit with the same value is seen on the other side. Players take turns in clockwise order –there are five phases to each turn. Resolve the dice – There are 6 basic symbols on the dice. You can resolve them in any order, but you must resolve all dice of the same type at the same time. Heal – Gain life points back – move the marker up on your monster card. You generally cannot have more than 10 life. Attack – deal 1 damage for each claw – if you are in Manhattan, you deal one damage to everyone else not in Manhattan. IF you are outside Manhattan, you deal one damage to everyone IN Manhattan. Destruction – you use these points to destroy the buildings or military units in the borough where you are. Depending on the level of building/unit, you can gain VP, energy or life points. If you destroy a building, you flip it over to the unit side. If you destroy a unit, you take the tile in front of you. Skulls – If you roll at least one skull, the military units in your area will fire on you and make you lose VPs. The more skulls you have, the more units fire upon you. If you do manage to roll three skulls, all Monsters take damage, and you get the Statue of Liberty card in front of you. This card is worth 3VP as long as you own it. Buy cards – there are always three special cards available at the start of a turn. You use your accumulated energy cubes to buy these cards. 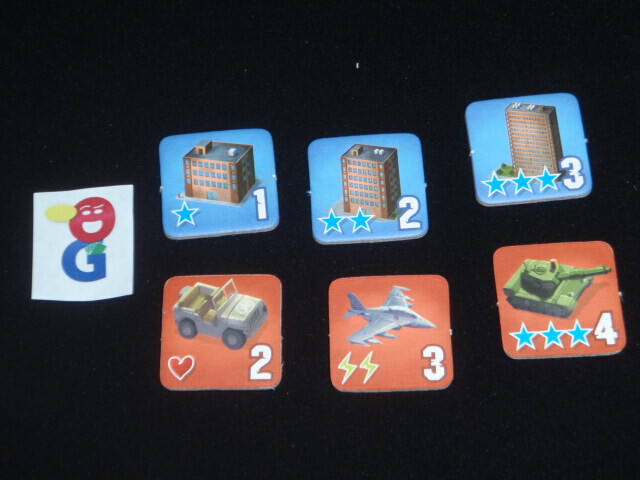 Like in King of Tokyo, you can always spend two of your cubes to flush the supply and deal out three new cards. End of turn – this really isn’t a phase other than the fact that there are some special effects on the cards that take place at this time of your turn. Manhattan – ok, so what’s the big deal? Well, as we all know, Manhattan is where it’s at. In this game, there are three zones to the borough. When you move in (and you are obligated to move in if there is no one else there at the start of your turn), you start in Lower Manhattan. If you stay there until your next turn, you move up into Midtown Manhattan. One more turn, then you’re in Upper Manhattan! Why do you want to be there? Well, when you first move in, you get 1 VP. Then, at the start of each turn that you are there, you get 1VP, 1 energy if you are in Lower, 2 VP, 1 energy in Midtown, and 2VP and 2 energy if in Upper Manhattan. Of course, you’re a big target when you’re there. First, on your turn, you can’t use hearts to heal yourself. But also, when anyone else rolls a claw, you take damage. So, you better watch your health! At any point, if you are attacked (on someone else’s turn), you can vacate Manhattan… of course, after you take the damage from that player. This one is a hit with the boys. Mostly because they love rolling the dice, making monster sounds and inflicting damage upon each other! The game feels very similar to its predecessor, King of Tokyo – but the action cards and the Statue of Liberty/Superstar card change it up enough. The buildings and military units also give you a few more things to do on your turn and a few more ways to inflict damage on your opponents. 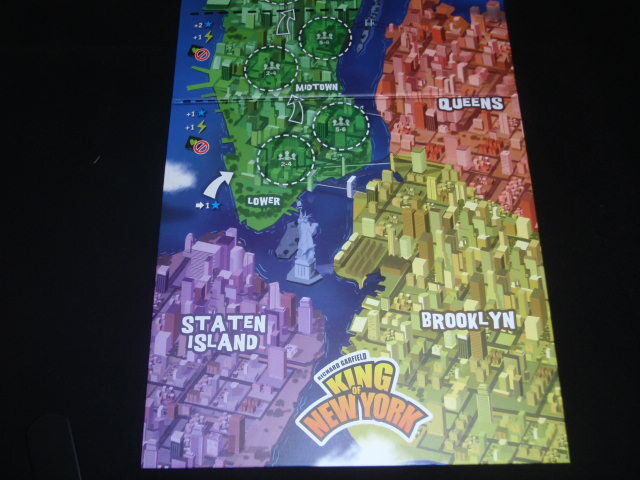 Like King of Tokyo (KoT), one of the biggest decisions in this game is how to deal with being in Manhattan. The rewards can be high – getting VP and energy each turn you stay in the borough – but you have to be able to withstand the attacks. Not being able to use Hearts to heal generally limits your stay to one or two turns at most, but sometimes the dice might be in your favor. The special cards have varying strength – just like in KoT – and sometimes you just have to hope to be lucky to have good cards available on your turn when you can afford to buy them. 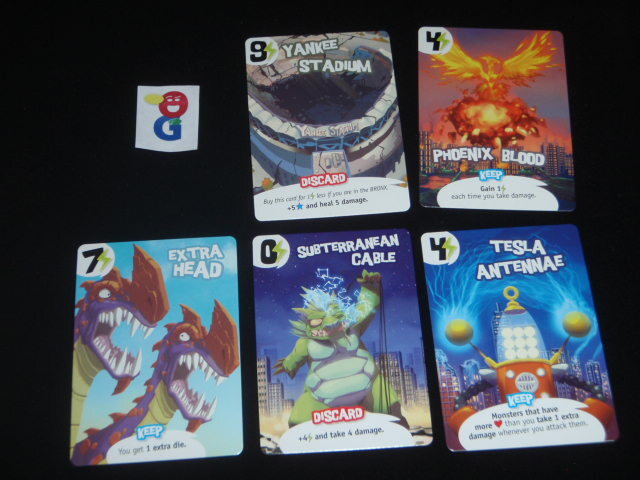 I have not done an exhaustive comparison between the cards in this game and King of Tokyo – but in the end, an overall comparison probably doesn’t matter. You just deal with them as they come up, and hopefully you are able to buy good ones on your turn. The art/production is similar to King of Tokyo with bright emotive art and humongous player movers. While I know that IELLO loves these oversized movers, I find them a distraction in this version of the game because their size makes it really hard to see the board and all of the buildings/military units that are strewn on the board. Do you need to have both KoT and KoNY? Probably not – I will likely end up keeping one in “my” collection and letting the other one go to the kid’s game closet. But, I’d be happy to play either when looking for a nice beer and pretzels laugh-it-up type game. In the end, I enjoy both for the roll the dice and beat everyone up fun. King of New York might be a tad more complex with the new twists, but it’s still easy for even the newbies to pick up quickly. Patrick Brennan: It’s probably better than Tokyo because the dice “keep vs re-roll” decisions are a touch harder to make. The game adds buildings to the board, and replaces star rolls with stomp rolls to stomp buildings for points, and chomp rolls to damage other people by the number of stomped buildings in their area. That’s basically it. Other than that, it’s much the same game, same experience. It’s not different enough to own copies of each, nor to give a different rating for each. It’s still a fun dice game loaded with great theme though. Dan Blum (1 play): I like it better than KoT primarily because the dice are better – the numbers on the KoT dice were not very interesting unless you bought one of a few cards. The buildings are military units are fine but are there to make the new dice work well. 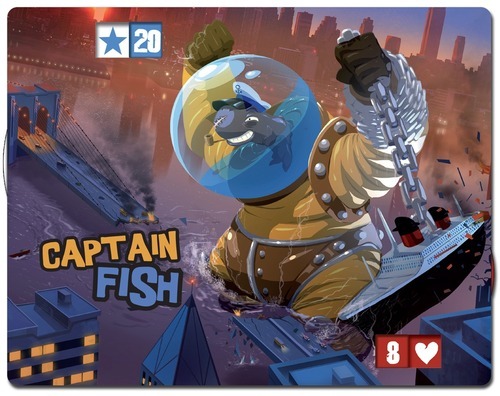 Joe Huber (2 plays): While I agree with Dan that the switch away from the numbers on the King of Tokyo dice was a good idea, I’m not convinced that King of New York is really _better_ for the change. The sweet spot for the game, in my opinion, is as a fast, light, slugfest; the changes for King of New York make the game drift a little away from that. It’s still fun – I like the game, and am happy to play it – but I’m not convinced that it retires King of Tokyo for me. I do think it might prove an interesting evolutionary step towards a version of this system that becomes an all-time favorite for me, though. Just played this finally. The original King of Tokyo was a huge hit with my school gaming group (mostly 5th graders), so I naturally had to try this one with them for something different. I agree with Joe that the dice are more interesting (never really liked the numbers), as is having more of a spacial element (the buroughs) but also agree that the level of fiddliness added by the new rules starts to push the game out of the “light gateway game” category. It’s also difficult to remember all the steps, now that an extra “move” step is added to each turn–especially the move to the next level in Manhattan. In Manhattan, it’s very difficult to remember the order of things, as you are supposed to collect your bonuses first, then roll your dice and take your turn, and then move to the next level. It just seems more intuitive to move to the next level at the beginning of your turn, and it’s easy to forget to do so at the end. I also had difficulty figuring out the rules to some of the new cards. Some of them did not have enough information or were overly complicated. I’m also with Joe in hoping that there will be a better follow-up to KoNY that will take some of the new elements and make them into a cleaner design the plays more fast and loose like it’s predecessor. I like it, but not enough to get rid of KoT nor to recommend it above its predecessor.